Diane Baker was born and raised in Hollywood, her mother had appeared in early Marx Brothers films. She began appearing in movies in 1959. Yes--consummate actress too often only allowed to play the wise secretary who was going to save her boss. ("They're Tearing Down Tim Riley's Bar", a Rod Serling "Night Gallery" story). I am a huge fan of Dianne Baker. I loved her in Alfred Hitchcock’s Marnie. I can’t remember the name of the movie, but in it, she co-starred with Joan Crawford. I love CBSRMT and Turner classics, where I enjoyed the movies I referred to. Diane Carol Baker (born February 25, 1938) is an American actress and producer who has appeared in motion pictures and on television since 1959. After securing a contract with 20th Century Fox, Baker made her film debut when she was chosen by director George Stevens to play Margot Frank in the 1959 motion picture The Diary of Anne Frank. In the same year, she starred in Journey to the Center of the Earth with James Mason and in The Best of Everything with Hope Lange and Joan Crawford. Sme of the other Fox films in which Baker appeared include the assassination thriller Nine Hours to Rama, Hemingway's Adventures of a Young Man and The 300 Spartans. Her television work in the late 1950s and 1960s includes appearances on Follow the Sun, Bus Stop, Adventures in Paradise, The Lloyd Bridges Show, The Nurses, The Invaders (in the first episode), and Route 66. Finally out of her contract with Fox after starring in 1960 in the fourth screen version of Grace Miller White's novel Tess of the Storm Country, Baker appeared in The 300 Spartans (1962) and Stolen Hours, a 1963 remake of Dark Victory, and, the same year, opposite Paul Newman and Elke Sommer in The Prize. From 1963 to 1966, Baker had a recurring role on the medical drama Dr. Kildare. In August 1967, Baker had the distinction of playing David Janssen's love interest in the two-part finale of The Fugitive. n 1968, she co-starred with Dean Jones in the Disney film The Horse in the Gray Flannel Suit. In January 1970, she had the lead guest-starring female role as Princess Francesca in the only three-episode mission of Mission: Impossible. In 1973, Baker co-starred in ABC sitcom Here We Go Again. Diane reemerged on the big screen in The Silence of the Lambs (1991) as Senator Ruth Martin ("Love your suit," Hannibal Lecter memorably said to her). Baker also appeared in the films The Joy Luck Club, The Cable Guy, The Net and A Mighty Wind. She guest starred in four episodes of House in 2005, 2008 and twice in 2012 as Blythe House, the mother of the title character. I just saw her in the William Castle film "Strait-Jacket". Fantastic! Enjoyed it. Great cult flick. watched "Strait-Jacket" tonight as well. 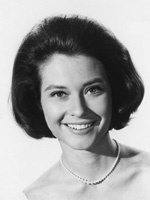 I've had a crush on Diane Baker for years. She was in one of my favorite Night Gallery episodes -- "They're Tearing Down Tim Reilly's Bar" -- and plays Dr. Richard Kimble's love interest in the final "Fugitive. Today we will reflect on Diane Baker, forget Silence of the Lambs, this was my favorite Baker film: The Best Of Everything. She plays a secretary. She is late the first day to work, she is kept after hours, her supervisor comes on to her, she is asked on a date at a picnic, winds up pregnant, she thinks he is going to marry her, he is driving her to get an abortion, she jumps out of the car, has a miscarriage, winds up hospitalized, Her room mate commits suicide. I loved this movie! Another twisted one she did was A Little Game, a movie of the week. She is married to Ed Nelson, her son, his stepson, is a nut job. It is written by the brilliant Fielden Farrington who wrote some CBS Radio Mystery Theater shows. He was awesome with ghosts and stepchildren. When he did his alien and UFO garbage, he bombed.